Last week was the International Quilt Association meeting in Houston. I am so glad that I went! I used the excuse that my quilt, Imagine, was in the show. It was indeed fun to see it on display but my greatest enjoyment was getting to see the other works in the show. I feel as though, in some ways, I had forgotten the breadth of the quilt world. It was totally uplifting to see the quality and imagery of so many artists from all over the world whose works were displayed. 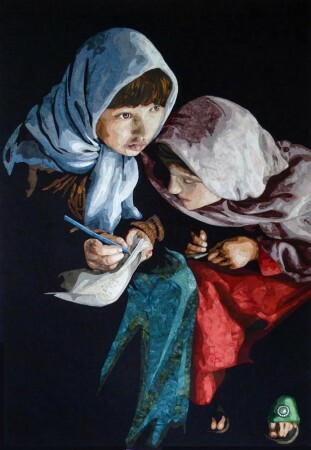 Eager to Learn by Gillian Shearer was drawn from a photo taken by a photographer in the Wakhan Corridor, Afghanistan of 2 young girls eager to learn in one of the Taliban targeted new girls school. The plight of education for girls in that region is close to my heart – I have long supported the work of the Central Asia Institute that happened to have built the school these girls were attending. All of the winning quilts were amazing and you can see them listed on the International Quilt Association’s website. It can at least give you a glimpse into the quality of the work displayed in the main exhibit. Of course, the show had many additional exhibits beyond the main exhibit, Quilts: A World of Beauty. SAQA had two exhibits, Wild Fabrications and Balancing Act. I enjoyed getting to volunteer at the SAQA booth and meet some other members. And, there were the vendors! I spent some time going over the list of vendors before the show opened and was delighted to find some of my favorites. 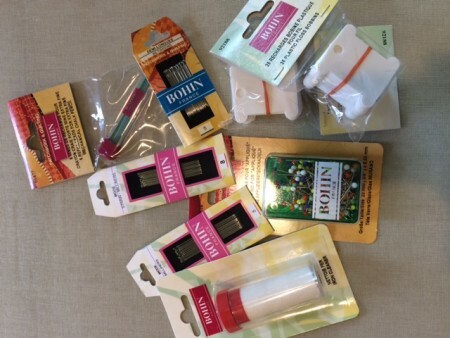 The Bohin company produces my favorite needles, marking pencil and also iron cleaner. It was total joy to go through their wares and, of course, come home with a collection. I also stopped by the Mistyfuse booth and left with a supply of my favorite fusing. In addition, I brought home ultraviolet Mistyfuse and some Bunny paper to play with. Will let you know what I think of the Bunny paper as I experiment in the coming weeks. Finally, I found a booth with Tsukineko Inks. I had intended to search online for these inks eventually so finding them in Houston was a real bonus. I was able to watch a demo by Thomas Teng of TSC Designs and then take advantage of a show special that sent me home with plenty of ink and tools to keep me busy. My hope was to get energized in Houston. Mission accomplished! Now we will see what evolves from the seeds that were planted! Great hearing about the products you invested in during your Houston trek……..your quilt is fabulous……..
Also, must say….it’s been fun (with a bit of green eye envy) following the construction and now move in of your new house. Though building can be nerve wracking…..I really enjoyed the process and wish we could have done that here instead of settling for someone else’s idea of house design! Nice write up! I’ll be interested in the Bunny paper and what you think. Wish I could have met up with you for awhile! Thanks for sharing your Houston experience, Judy. That winning piece is absolutely wonderful — so poignant. Puts the point across so very well! sounds like you had a fabulous time at the show Judy…..still jealous here!! Glad to hear you were inspired by your Houston visit! I can see why Eager to Learn caught your heart… lovely and timely all at once.